The popular Taiwanese BL (boys love) drama series HIStory is coming back, and there’s no time to lose. 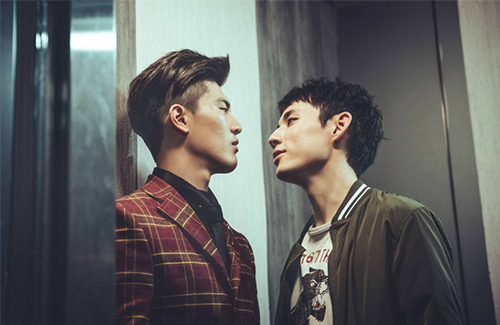 The web drama series first premiered in 2017 with much fanfare, as it aired in a time when gay romances were not common occurrences in popular television. The series has a history of playing with forbidden love, and for season three, the focus will have its eyes on a romance between a triad leader and a cop. The drama, subtitled Trapped <圈套>, stars Jake Hsu (徐鈞浩) as a young and hot-blooded police officer who is tasked with the job of protecting a young triad leader, played by Chris Wu (吳承洋). The series is directed by Lee Ching-jung (李青蓉), with Lin Pei-yu (林珮瑜) and Shao Hui-ting (邵慧婷) as scriptwriters. The season will be released in two different parts, comprising a total of 40 episodes. Trapped will take up the first 20. It premieres April 16, 2019. I want to love this, and Chris Wu and Andy Bian are super handsome, but that Jake Hsu is way overacting in these trailers. Got my fingers crossed I won’t feel the same way when I see the full episodes.